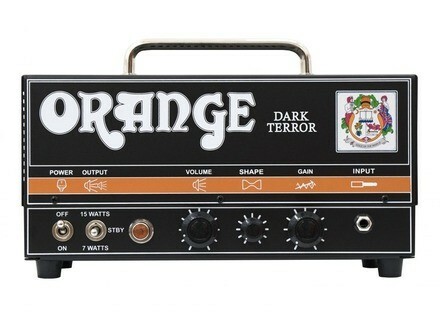 Dark Terror, Tube Guitar Amp Head from Orange in the Terror series. * The most practical thing about this head are its size and weight. Perfect to rehearse without breaking your back. The speaker that comes with it, the orange 2X12 celestion vintage 30, is also very light (after having used a 2x12 Engl, so I know what I'm talking about!). * It features a switch to select the power: 7 or 15 watts, up to you. The 7-watt mode is enough to play with my band, more than enough to play along with a drummer and the rest of the band. It's worth noting that you need to really crank the volume on a tube amp to get its best sound: 7 watts with the volume halfway or 3/4 up (distortion 3/4 up as well, it increases the volume) and you can make yourself heard. The 15-watt mode is better to play clean and use overdrives/distortion from a pedalboard. * Effects loop for modulation effects (chorus, delay, reverb and whatnot). * Dialing it in couldn't be easier. One volume, one tone (for the mids) and one gain control. * The famous switch to toggle between 7 and 15 watts output power. Enough to play in a band. Live, amps are usually miked so there's no need for excessive output power. Anyway, this head delivers enough power for small gigs. * With the gain cranked all the way up or set to 3/4, you get a nice distortion. 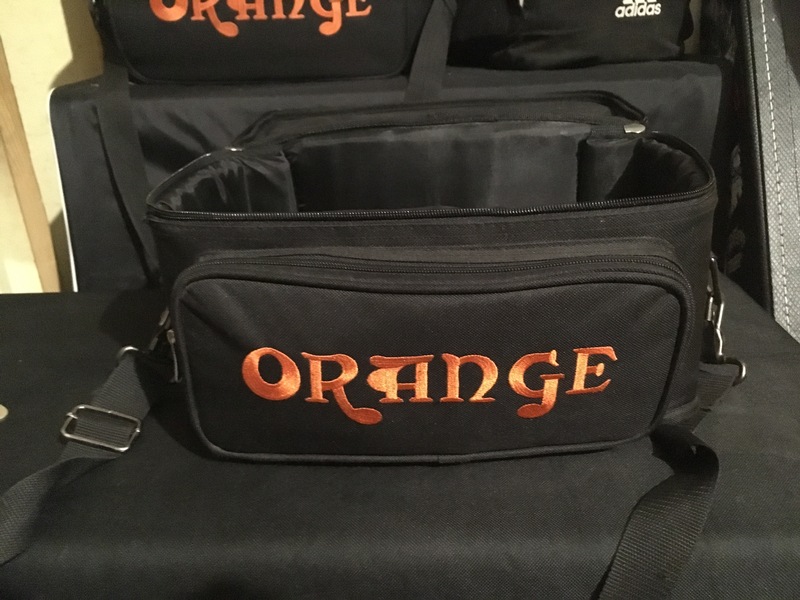 The Orange sound remains fat, it's a matter of taste and colors. It can be a bit muddy, not very precise nor well-defined. If you use a pedalboard, it will be easier to get a biting distortion with more precision. * The clean distorts pretty fast, it crunches as soon as you touch the gain. * The tone control acts on the mids. At the center, it has no impact on sound, I think. Turning it left you get a rock sound, a "British" sound. On the contrary, to the right it's an "American" sound with scooped mids, it's resolutely metal. My favorite setting is to turn this pot to 10/11. I think you can find this type of controls on Blackstar gear! * I tested the Jim Root (Slipknot) signature model. I didn't like it as much and, strangely enough, the distortion seemed less vicious. + : Reduced size and weight, transportation ease, its looks, the brand, the simplicity! - : I would've loved to have classic EQ controls, bass/mids/treble, which work really well! Note: There is the Orange dual terror for people who want two channels. But a two-channel Dark terror would be awesome (just in case the guys at Orange read this review!) ! All-tube amp with 7- or 15-watt switch. The hardest is to choose between the 8- and 16-Ohm outputs and the effects loop. I play a Gibson SGJ 2013, a ToneLab ST and a Palmer cab with 2 Celestion V30s (PCAB212V30). Together, this setup give me all the sounds I want. I've been using it since June 2013. I used to have a MustangII before, but it can't come even close to this amp head. Moreover, I didn't know why I had so many problems with my settings. Was it the Mustang? The Tonelab? Now I have no problems. In terms of money, the quality will make you forget the price. 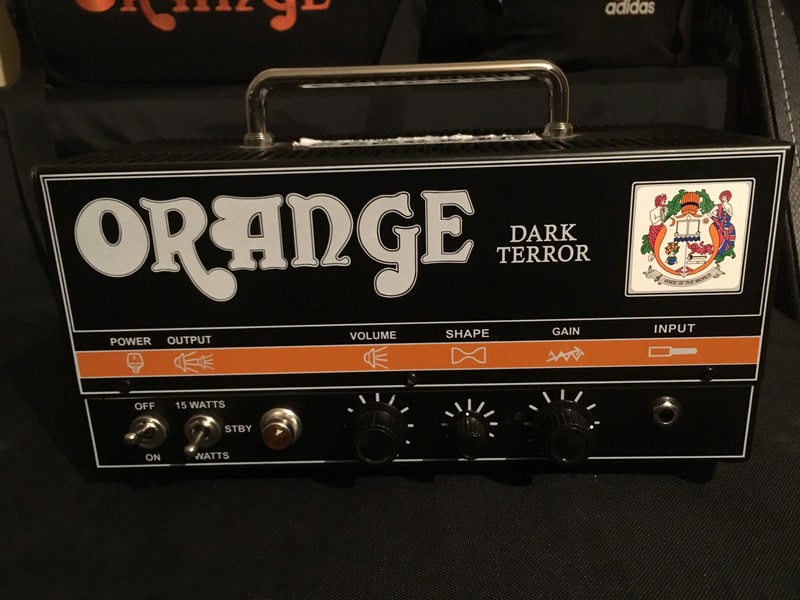 As a big fan of the original tiny terror and dual terror I pretty much had to check this little amp out. The price point is attractive. But let's see if the amp pays off. The FX loop is great. 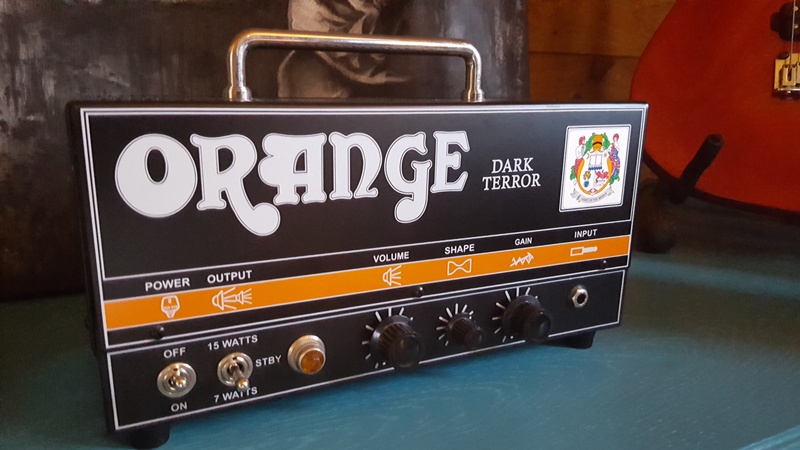 All orange loops tend to be really good and they really have this nailed down on their amps. I use mine with a Bogner Oversized 2x12 most of the time. I tend to favor my old Ibanez rg550 with it a lot. The shape knob is probably one of the best features in an amp that really makes an EQ section redundant. Careful control of it will give you all the tones you could want. I will admit that this amp is great at high gain and it can "chug" better than a lot of bigger heads. But the lower gain tones are also surprisingly great. It even cleans up nicely. Who would have thought? It's helpful to think of the dark terror as a tiny terror with a slightly more aggressive voicing and a lot more gain on tap. This amp is louder than the tiny terror. Just getting that out there. It sounds like it has 22 watts to the TT's 15. So keep that in mind. You can play just about any gig with this. There's a ton of headroom oddly enough. The only knock I could say is how similar it is to the tiny terror. 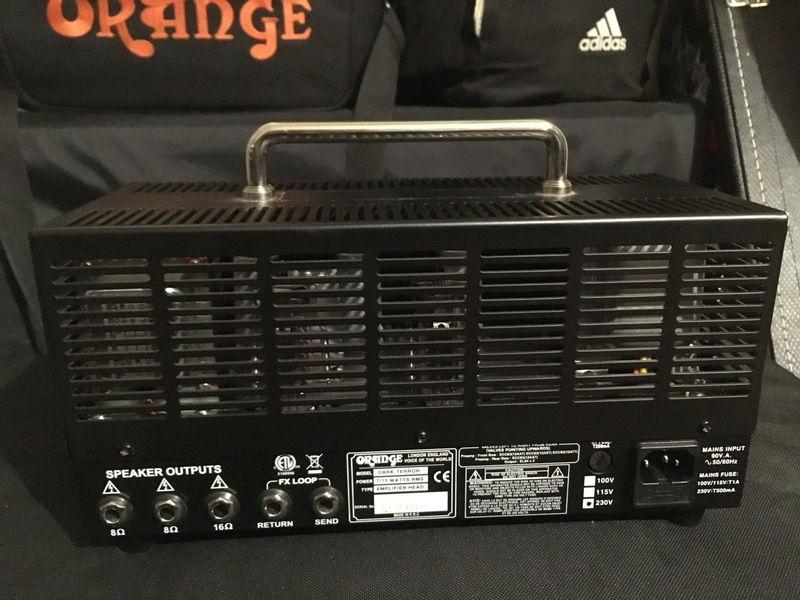 To be fair, I think this is overall a more usable amp especially if you player heavy metal or the like. If you are playing classic rock or something then stick with the TT. The amp has that familiar British grind that you found in the 60's and 70's went they were the leaders in getting high gain sustain from their guitar rigs. This little box does what a full stack can do in a pint size proportion. It sounds fantastic and gets chewier and smoother as you hit it harder with more volume. 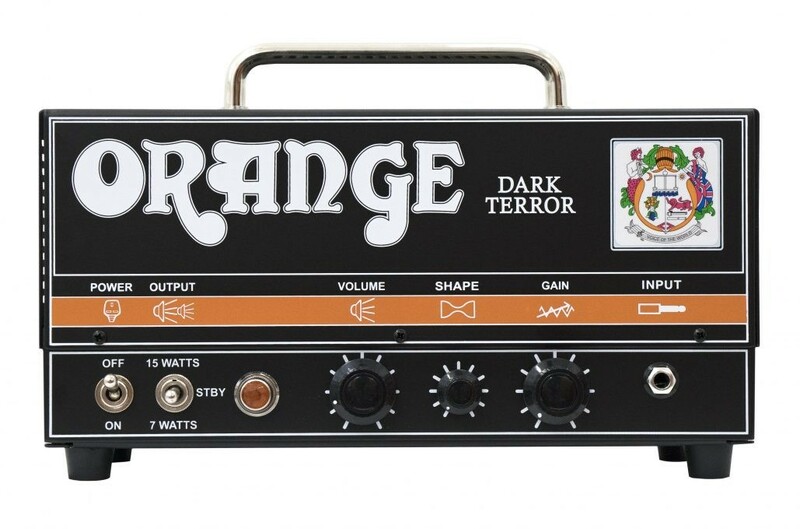 This amp is the same spec as the original tiny terror but just in a black amp casing. Same great tone as would imagine and the fantastic new look. Valve Driven FX Loop. High Gain Preamp. Many manufacturers have now saw the overwhelmingly positive result that Orange got from this and are now doing the same thing. Mesa Boogie released one last year as well as Vox. Hughes and Kettner is releasing one this year and you'll see that in the trade shows real soon. There has been an untapped market for these little light weight but heavy punch high gain amplifiers. I would recommend this amp to anyone who needs pint size amp with a kick. At new these amps come in at a round $650. Great bang for your buck in these harsh economic times. If you are still hesitating about going to Musikmesse this year, Orange Amps gives you a good reason to join the party on April 10th in Frankfurt.